I did wonder whether the title sounded a little too grand. But no. After having it for dinner the last few nights I've been at home, I think extravaganza sounds OK! It really is a treat of a dinner. Or a lunch. But the very best thing? Well maybe the taste is the very best thing... The second best thing? It's so not bad for you at all! No really. 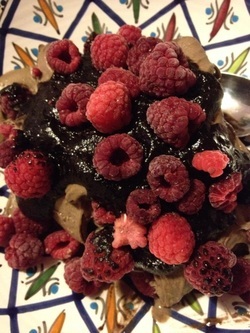 The ice cream is simply bananas with a tablespoon or so of carob powder. The sauce? Dates, coconut water and carob powder. And decorate with fruits (or as I did last night, some pecans too). Blend in high powered blender until fully ice creamed. If your blender is less high powered then leave the bananas to defrost until you can get a knife through them then blend. You may need to add a little 'milk' or a non frozen banana to be kind to your blender. If you make up the sauce first then scrape out the blender fairly fully but not overly well then you can just add the bananas without the extra carob powder. Decorate as you wish (I've had strawberries, raspberries and raspberry with pecans as variations on mine so far) and enjoy!